It’s almost SUPER BOWL!!! I actually get super excited about Super Bowl. Halftime shows, awesome commercials, SO many good eats, and oh yeah, football. LOL. While most people have their eyes glued to the screen I am usually hovering over the food. 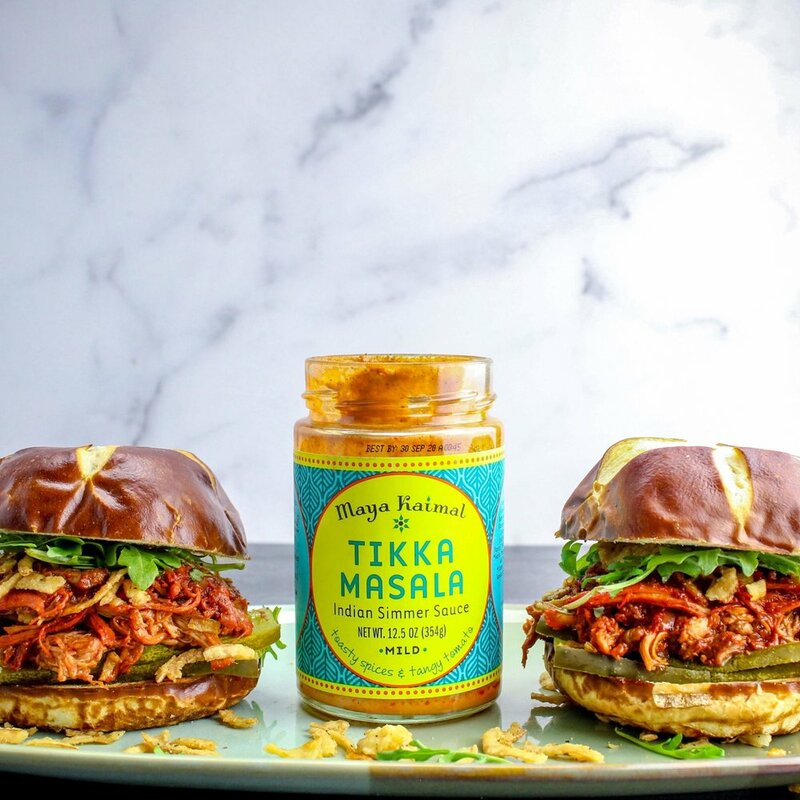 I like to bring something easy to a party like chili, or a dip, but today I’m stepping it up with these Chicken Tikka Masala Sliders! Well, sandwiches because you won’t want a dinky slider after you try this! It’s super easy…done right in the Instant Pot (or slow cooker), with very little prep. I love the Maya Kaimal simmer sauces because they taste super authentic and aren’t over spiced. Sometimes premade simmer sauces have so much of that dried spice flavor that you can’t taste the freshness, but these are perfect. My 3 year old think’s he’s eating his grandma’s “chicken matika masala” which is a HUGE win. And we need a win for Super Bowl, yah?! So grab some Maya Kaimal simmer sauces before game day and plan on making these sammies. They have ready to eat dals too which are fantastic! Turn Instant Pot to Saute mode, and once hot add 3 tablespoons of butter. When melted add the sliced onions and 1/2 teaspoon of salt. Let these cook down for about 10 minutes or so until they are nice and caramelized. If they are starting to burn turn Saute heat level down a notch. After they are golden brown turn Saute mode off. Add the chicken thighs and the simmer sauce. Close the lid, and cook the chicken for 12 minutes on Manual mode (or Poultry mode if it’s still set to that on your Instant Pot). Once done let the pressure naturally release for 5-10 minutes, and then quick release. Open the lid, and shred the chicken using two forks. Add a nice squeeze of lime, black pepper, and more salt if necessary. You can also add some cayenne pepper or hot sauce if you want a little more spice. Crock Pot/Slow Cooker: Caramelize onions in a skillet. Transfer to slow cooker with chicken and sauce. Cook on high for 4 hours until chicken is no longer pink and shreds easily. Assemble sliders with pickles, arugula, lettuce, or slaw mix, and fried onion strings. DO NOT FORGET THE FRIED ONION STRINGS! A huge thank you to Maya Kaimal Fine Indian Foods for sponsoring this post! Their story and taste is authentic, and restaurant quality.